Spring in Wisconsin is all about contrasts. We have warm days and cold nights. You can walk down the bike path and see runners in shorts, and ice fishermen on the bay. In spring I’m also drawn to foods that bridge the seasons – light soups with hearty bread, hearty curries with bright citrus notes, and this dish – pasta and veggies in a creamy sauce. Wait? Isn’t this a vegan recipe? Yep, it sure is. My good friend coconut milk comes to the rescue again. With a bit of lemon and touch of basil and plenty of garlic, this dish could pass the test for even the most die hard dairy lover. Set a pot of water on to boil while you prep all your veggies. Dice the onions. Mince the garlic. Slice the zukes in quarters lengthwise, and then slice (in other words, sort of dice them), cut the broccoli into bite-size bits. Heat a large frying pan over medium high heat. Add the olive oil. When the olive oil is warmed, add the onions. By now your water should be boiling, so put the pasta in the boiling water. Sauté the onions until translucent. Add the garlic and sauté about 30 more seconds. Add the zucchini. Cook until zucchini just begins to soften (about 3 minutes). Add the salt and pepper and the broccoli. Cook for 2 minutes, stirring constantly. Turn the heat to low and add the coconut milk and lemon juice. Stirring occasionally, cook until the coconut milk begins to thicken. Remember that pasta? It’s probably done by now. Drain it. Don’t rinse it, and add it to the frying pan. Add in the chopped basil. Taste and adjust the salt and pepper. Plate and serve. This entry was posted in Italian, pasta, vegan. Bookmark the permalink. Just made this recipe for dinner for my boyfriend’s meat-eating parents and sister and everyone loved it! One of them said it was the best pasta she had ever had, and I have to agree. 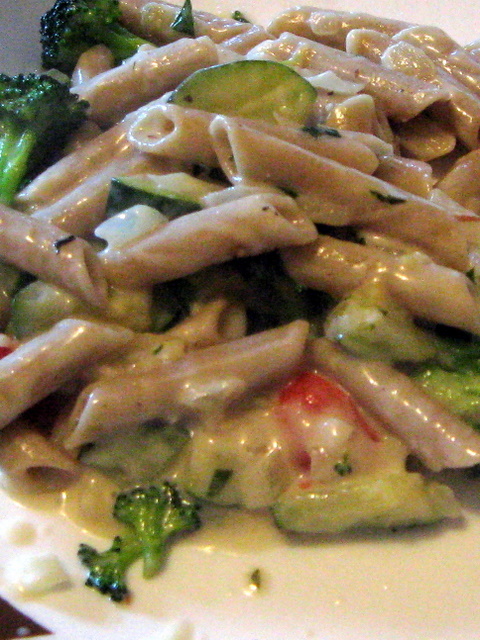 We ended up adding more red pepper and onion and some soy milk, and served the pasta with steamed asparagus. I will definitely make this again! Highly recommend.